BAU 2017—that is 185,000 square meter of materials, technologies and systems. Some 25 soccer fields of state-of-the-art technology for the international construction industry. In a five-part series, we look at the main focuses of the exhibition sectors at the fair. Part 2 deals with the topics steel, chemical building products and building systems. The versatile material steel can put its qualities to the test time and again because today's construction tasks call for increasingly flexible and economic solutions that also meet the highest sustainability requirements. One focus of BAU 2017 is steel elements for roofs and facades. Besides meeting insulation and sound-protection requirements, design qualities also play an increasingly important role. 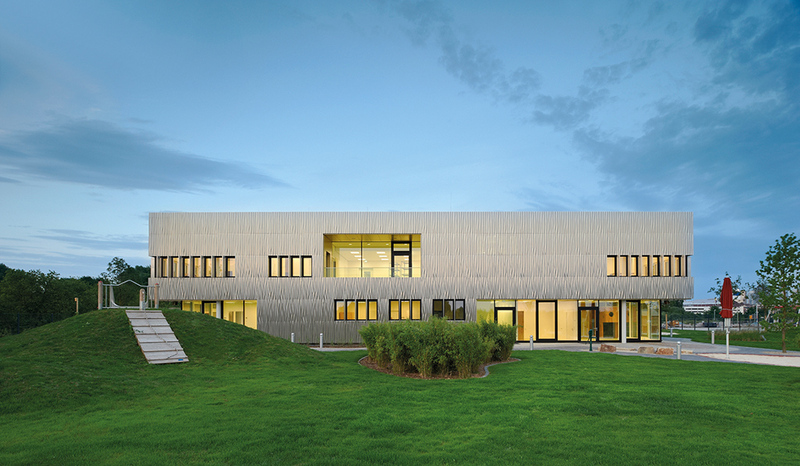 For example, the facade that the working group of JSWD Architekten and Chaix & Morel et Associés developed for the ‘Miniapolis’ children's daycare facility in Essen won first prize at the 2015 Steel Innovation Awards: A hydromechanical process was used to reshape facade elements three dimensionally, giving the overall appearance a wavelike look. The light weight of the components, which can be mounted quickly, also guarantees a great deal of efficiency. Pantile sheets made of steel offer the same advantages: At approximately five kilograms per square meter, they are extremely light, and because they are secured to the substructure with screws, they can also withstand extremely strong winds. Structural systems made of lightweight steel sections are another one of BAU's main themes: flexibility, short building times, a high degree of prefabrication and affordable building costs make them suitable, especially for adding additional stories and for additions, conversions and expansions. Their low design thickness also makes it possible to maximize usable space. Besides several solutions for profile, structural steel and facade systems, visitors can also expect a wide range of new developments in the sectors for sunshade systems, stainless steel as well as zinc and copper surfaces and systems. The fair will also place special emphasis on aspects of sealing and concrete restoration and repair. The latter is not only an important topic when it comes to large infrastructure structures such as bridges, but also in the case of smaller structures such as garages. Garage floors are subject to sustained loads. They include high point loads when driving in and out of the garage on the one hand, but are also due to the effects of oil accumulation as well as weather fluctuations, deicing salt and moisture on the other. As a result, unsealed floors can crumble or suffer damage such as cracks and holes. That is why PCI Augsburg GmbH, for example, developed a complete system solution for renovating private garages, from repairing the garage door's threshold area to double coating the garage floor. The Gotthard Base Tunnel is a good example of what is possible and necessary in large-scale infrastructure projects. The longest train tunnel in the world was officially opened on June 1. Chemical building products from BASF and Sika were used to build it. One example of the special challenges in tunnel construction is that the concrete must remain workable on its way into the tunnel, but it must also harden immediately after being applied to the tunnel wall. Concrete additives—a combination of plasticizers and shotcrete accelerator—make that possible. Besides the above-mentioned topics, once again this year's BAU will also showcase solutions for plasters, varnishes, paints and adhesives as well as insulation materials for protection against heat, cold, fire and noise and facade systems. Stricter requirements with regard to energy efficiency—for example in the form of Germany's Energy Saving Regulations—make the use of renewable energies practically unavoidable. The sector for solar technology has a wide range of new developments to offer. For example, new cell generations and module types—PERC cells, glass-glass modules and high-power modules—are making it possible to increase energy output considerably. Demand for solar power storage units that allow flexibility with regard to when the generated electricity is actually used continues to increase, and the acquisition of grid-supportive storage units is subsidized by the federal government. The term “smart renewable energy” refers to the ongoing networking and digitalization of decentralized PV installations and storage units. The result is decreasing dependence on energy providers. Solar technology offers us an increasing number of possibilities, even when it is combined with other methods of generating electricity. Which is why the integration of photovoltaic power plants into existing wind parks guarantees the more efficient capacity utilization of existing power networks and a more regular input of power. Besides the topics of solar building and solar thermal energy, visitors attending the upcoming BAU can also look forward to the latest trends and developments in the sector for heating, ventilation and air-conditioning technology.